Collicutt Meats Haven't Minced Their Words! Home > News > News > Collicutt Meats Haven’t Minced Their Words! News: Collicutt Meats Haven’t Minced Their Words! The food industry, and rightly so, has to have very high hygiene standards, all food businesses must develop documented food safety management procedures based on HACCP, this means that businesses must identify where risks to food safety could occur and how they will control those risks. 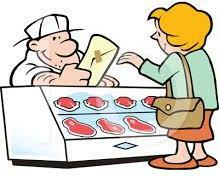 Butchers are known as higher risk, due to the handling of rare and cooked food and more rigorous procedures are required, with more in depth monitoring and recording requirement are required. These stringent health and safety rules and regulations mean that floor cleaning machines are an absolute must, with Collicutt Meats, a wholesale butchers being no different. Offering top quality meats to all types of local businesses, and having been going for almost 30 years, they are fully aware of their obligations towards health and safety. When they needed to replace their existing floor scrubber dryers they came to Clemas & Co Ltd, as a local company, with full ongoing support was essential to them. Mark Wright from Collicutt Meats explained why they were looking for floor cleaning machines “We were looking for a local supplier that could provide us with the right floor cleaning equipment, along with good aftercare support. We were after replacement machines that came with a service contract so we can keep them in better condition for longer! We contacted Clemas & Co Ltd, because they were just down the road, Emma Hancock the Sales Manager attended our site to take a look at what we need the machines for and then quoted us on the machines that were best suited”. Having a predefined service contract allows our engineers to come to site on a regular basis and go through all the working mechanics of your machines, keeping them in the best possible working order. Having a planned and regular servicing schedule helps us to identify any problems you may have with your machine, allowing us to respond and rectify before it becomes an issue. We are always aiming to keep your machine working at its optimum. “I found Emma to be helpful and knowledgeable, quoting us quickly and competitively on machines that suited our needs. The Tennant T300 scrubber dryer brushes, which attach through magnets are really helpful as they are so quick and easy to to change. The delivery of the machines included a full training session allowing my team to get fully acquainted with the machines” Continues Mark. If you are looking for a new machine, a replacement machine or a refurbishment on any existing floor cleaning machines, we are always happy to discuss any of your cleaning requirements so please contact our sales team on 01684 850777 for further information or complete our contact form. CALL OUR SALES TEAM ON 01684 850777 for further information.